Startly Technologies develops personal and productivity software that saves time and effort for countless Windows and Macintosh users worldwide. We are dedicated to providing solutions that are reliable, easy to use, and designed with both the expert and novice user in mind. With QuicKeys 4 doe Macf OS X you can automate your computer in two ways: Abbreviations and Shortcuts. Abbreviations, which are new in QuicKeys 4, are words you type into a document that are then automatically replaced by QuicKeys with longer text. Shortcuts are collections of one or more steps that perform specific tasks on your computer. Some examples are typing text, opening an application, clicking a button, or making a menu selection. For virtually anything you can do on your computer there is a QuicKeys step or a combination of steps that can do the same thing. Let's Get it Started! Product activation and some features require an Internet connection. Some features require an iPhone or iPod touch with QuicKeys Anywhere app installed. 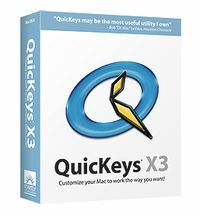 QuicKeys 4 for Mac OS X is the latest to its award winning productivity software for Apple's Mac OS X. With over 60 new features, version 4 of QuicKeys for Mac OS X is the most powerful and most useful version ever. New features include Abbreviations, Web Actions, MIDI triggers, and the QuicKeys Online service. QuicKeys is "the hands-down, golden lock, world's finest, unbeaten macro and automation program..." said Rich Levin, host, PC Talk Radio. David Pogue, New York Times, says "QuicKeys is also the only macro program I found that can perform my favorite stunt of all: it can turn the tilde key... into a left-handed Delete key, so you can leave your right hand on the mouse..."
QuicKeys X3 includes numerous improvements and new features that make QuicKeys more versatile and powerful than ever. Newly updated for Mac OS X 10.5 Leopard, but still works with Mac OS X 10.4 Tiger. New Automator action lets you play QuicKeys shortcuts from inside Apple's Automator allowing you to automate things that cannot normally be controlled from Automator. Support for new keys on the Apple 2007 aluminum keyboards has been added including new f-keys and media keys. New Advanced User Interface preference lets users scale the QuicKeys experience whether they are novice or pro users. QuicKeys Wait actions now have a new timeout feature. This feature lets QuicKeys work even better when running unattended. The QuicKeys Playback Palette can now be set to show only for specific shortcuts providing more customization of QuicKeys and less screen clutter. Plus many other updates and improvements. QuicKeys X3 requires Mac OS X 10.4 or later. Eddy Award winner for "Best Productivity Utility," recipient of a Four-Mouse rating from Macworld and one of Computer America's Top Ten Utilities of all time, QuicKeys is a personal productivity tool designed to eliminate repetitive and time-consuming computing tasks for Macintosh and Windows users alike. QuicKeys performs shortcuts that automate the computer tasks you do each day. Shortcuts can be created manually, using the QuicKeys Editor or automatically using the recording feature. You can scope your shortcut to play within a specific application or all applications. Trigger your shortcuts with a simple hot key, toolbar button, custom menu selection or timer and you'll be working smarter, faster, better. QuicKeys can best be described as a global macro program. You can use QuicKeys to create simple one-step macros such as key commands for menu items, or for typing canned text. You can also use QuicKeys to record a series of steps and play them back. Finally, you can write macro programs with QuicKeys alone or in conjunction with AppleScript, Frontier, and applications with their own scripting language such as FileMaker Pro and Panorama. You access most functions from a global menu at the right of the menu bar. The first three items activate the QuicKeys Editor (which supports the creation and organization of macros), QuicKeys Setup Assistant (which walks you through the creation of simple macros), and QuickReference Card (which displays a screen summarizing QuicKeys own and your universal Shortcuts and their triggers). QuicKeys can immensely improve your productivity by providing alternative methods of doing simple tasks and automated methods of completing repetitive tasks. Users can customize nearly all applications with QuicKeys instead of learning each application’s customization protocols (if any). For applications with multiple toolbars, you can deactivate most of them and substitute personalized QuicKeys Toolbars and keystroke triggers. QuicKeys can make many Mac OS functions simpler: changing printers, changing networking and communication protocols, adjusting monitor and speaker settings, etc. 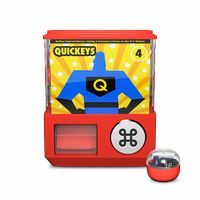 QuicKeys works with nearly every application, making it more versatile than (or a useful adjunct to) AppleScript or Frontier. I often combine AppleScript and QuicKeys when I work with applications that are not Open Scripting Architecture-compliant (or that only support the minimal required set of scripting commands). Power Mac with Mac OS 8.5 or later. 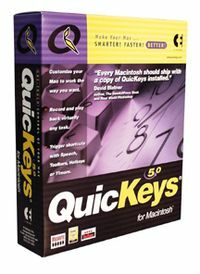 People who use Macintosh computers for a wide variety of tasks (especially long, repetitive ones) and who do not own QuicKeys should buy it immediately.